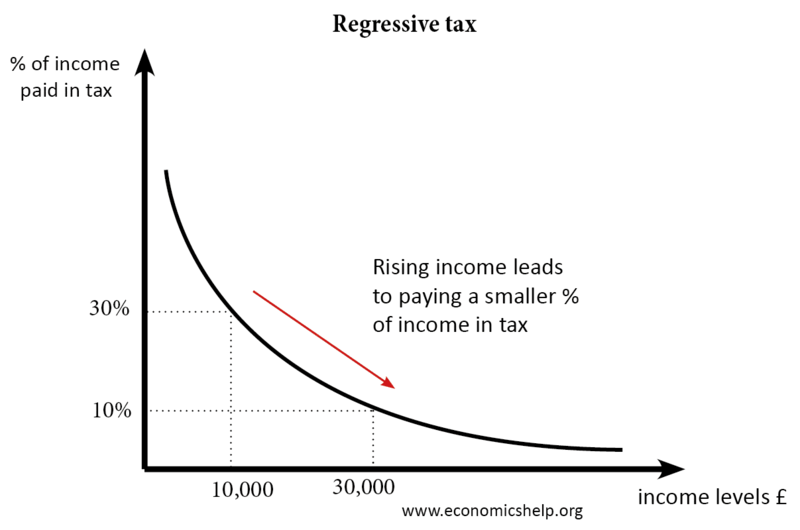 A regressive tax is a tax which takes a higher percentage of tax revenue from those on low incomes. As income increases, the proportion of your income paid in tax falls. Someone earning £100,000 would pay just 3.33% of their income in tax. 1. Gambling taxes – Those on low incomes have a high propensity to spend money on gambling and therefore pay a higher percentage of their income on gambling taxes. 2. Excise duty. Those on high income may spend more on petrol, but it is unlikely to be too significant, therefore as your income rises, the percentage of your income going on petrol tax is likely to fall. Efficient. Regressive taxes are non-distortionary. Income tax may discourage people from working. A poll tax will not affect economic behaviour. A regressive tax may be placed in order to reduce demand for demerit goods / good with negative externalities. For example, a tobacco tax is designed to reduce demand for cigarettes. It is regressive, but the aim is to reduce smoking rates. Parts of the tax system may be highly progressive (e.g. income tax, stamp duty). Therefore, some regressive taxes will not cause extreme inequality because they are counter-balanced by the progressive taxes. In the UK, VAT is levied at 20% on many goods. In theory, they are luxury goods, though, in practice, it is a wide range of items, but does exclude items such as food and children’s clothing. If someone has a higher income, they are likely to spend more and pay more VAT. However, as income rises, the marginal propensity to consume tends to fall as they save more. Therefore, as income rises, the percentage of your income used to buy goods and pay VAT declines. Therefore, those on higher incomes may spend a slightly smaller percentage of their income on VAT. However, it is complicated by the fact that those on low incomes will spend a higher percentage of their income on essential goods, like food which are not VAT rates. Pros and cons of a ‘fat tax’ – a potentially regressive tax on unhealthy foods.